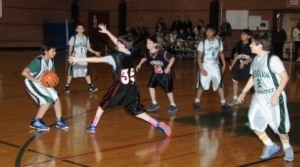 The Middle School Basketball team begins its season in mid-November, and finishes in late February. 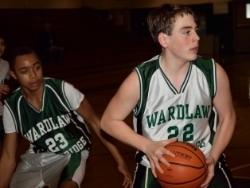 The Green team is made up of our older and more-experienced Middle School players. After a couple weeks of pre-season practices, they play up to two games per week. 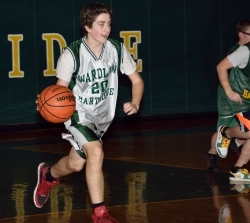 Many of our 8th-graders enjoy the opportunity of middle-school sports, but they are also preparing to contribute to our varsity teams in the future. A post player (Right) shows that he has the all-around skills to handle the ball. Many of our players are also competitive in other sports; the awareness and competitiveness they bring from soccer, lacrosse, or baseball helps them on the basketball court.